A Japan-based research team led by Kanazawa University has identified the MAPK Erk5 as a novel player controlling skeletogenesis. Their research sheds light on the question of how the complex our skeleton generates. Figure 1. Schematic model of this study. (A) In vitro kinase assay. Recombinant Smuf2 proteins were incubated with active or inactive Erk5, and subsequent Phos-tag SDS-PAGE, followed by immunoblotting. Recombinant Smurf2(WT) was phosphorylated by Erk5(active) but not by Erk5(inactive), whereas Smurf2 phosphorylation by Erk5 was stopped completely by Smurf2(T249A), in which the threonine was replaced with an alanine. (B) In vitro ubiquitination assay. Recombinant Smuf2 proteins and Smad proteins were incubated with active Erk5 in the presence of E1 and UbcH5c, followed by SDS-PAGE. 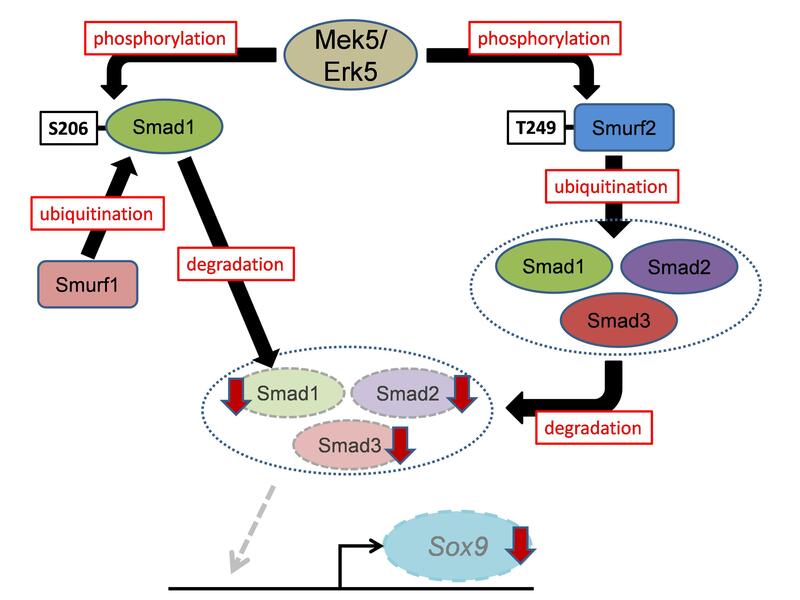 By incubating Smurf2(WT) with ubiquitin, E1 and UbcH5c caused Smad protein ubiquitination in the presence of Erk5 despite the weak ubiquitination signal noted in the absence of Erk5. 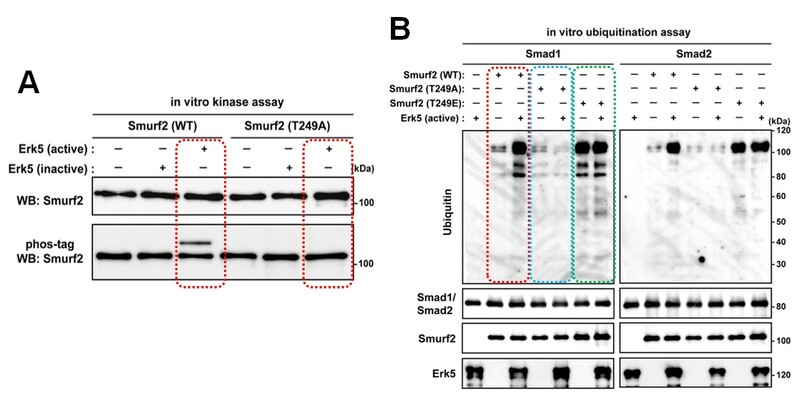 The reaction with Smurf2(T249A) produced a faint ubiquitination signal in the presence of Smads irrespective of the presence of Erk5, whereas extensive ubiquitination was observed when Smads were incubated with Smurf2(T249E), in which threonine was replaced with glutamate, in the absence of Erk5. This work was supported in part by the Japan Society for the Promotion of Science (16H05131, 17KT0051 and 18H04971 to E.H.); and the Japan Agency for Medical Research and Development (17824969 to E.H.).